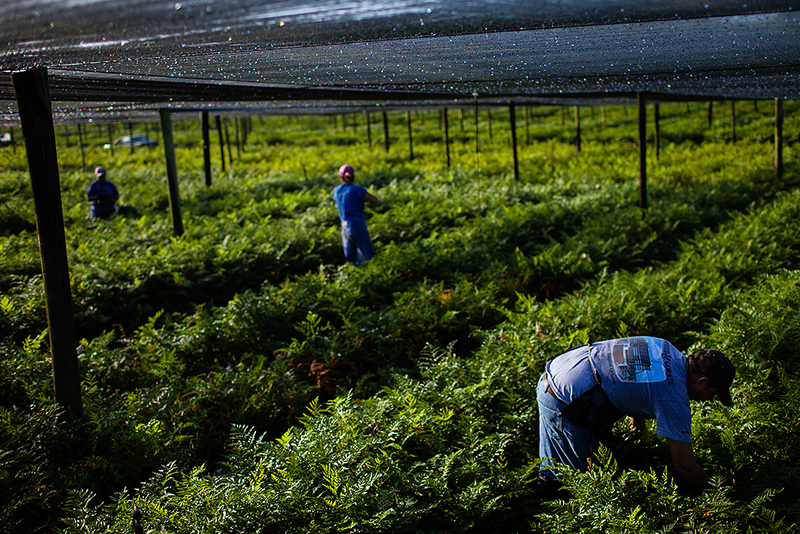 Farmworkers harvest ferns in Pierson. The "sprays" of ferns are exported worldwide for use in floral arrangements and other decorations. 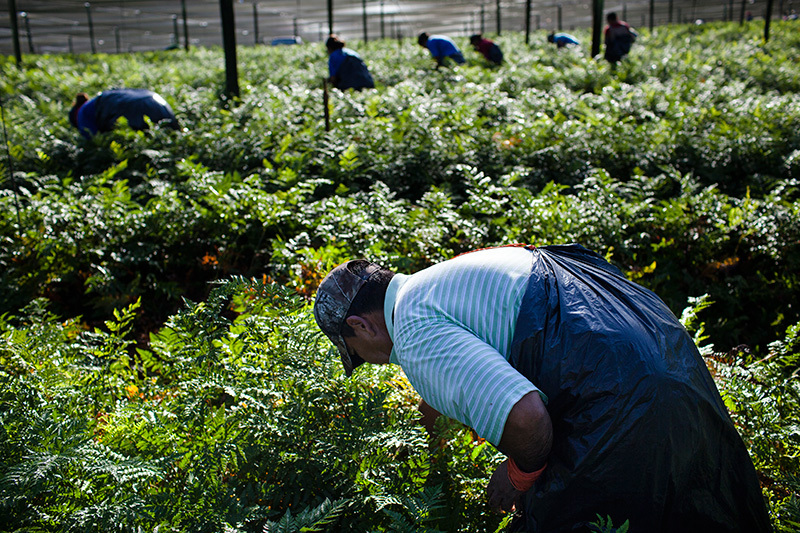 No one else in this country faces a more poisonous, unregulated workplace than the agricultural worker. Some three million farmworkers, from the greenhouses of Florida to the massive acreage of farm land of California, go to work each day, hoping not to get poisoned. Personal stories from agricultural workers illustrate the need for stronger protections from pesticide exposure. Pierson, Florida, the self-proclaimed “Fern Capital of the World,” grows 85 percent of all the floral ferns sold in the United States. 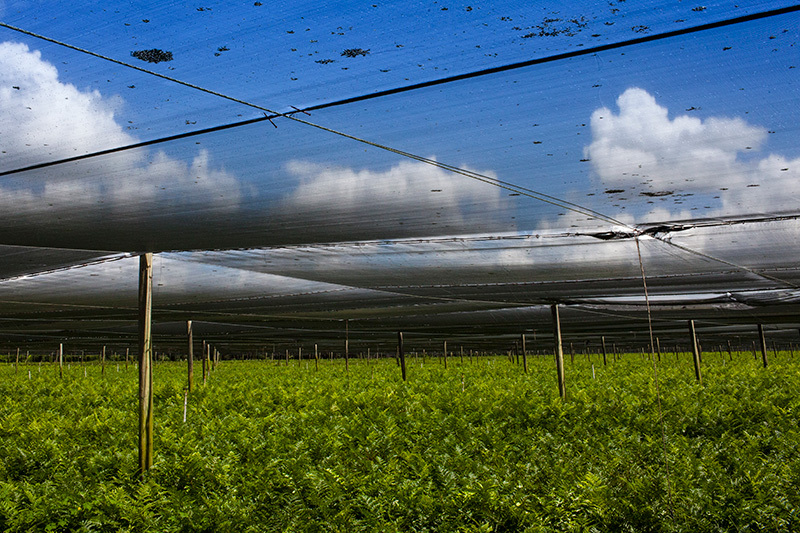 Covering some 6,200 acres, these ferneries are most often large, screened-in areas where teams of workers pick leaves and assemble them into bunches as fast as they can. 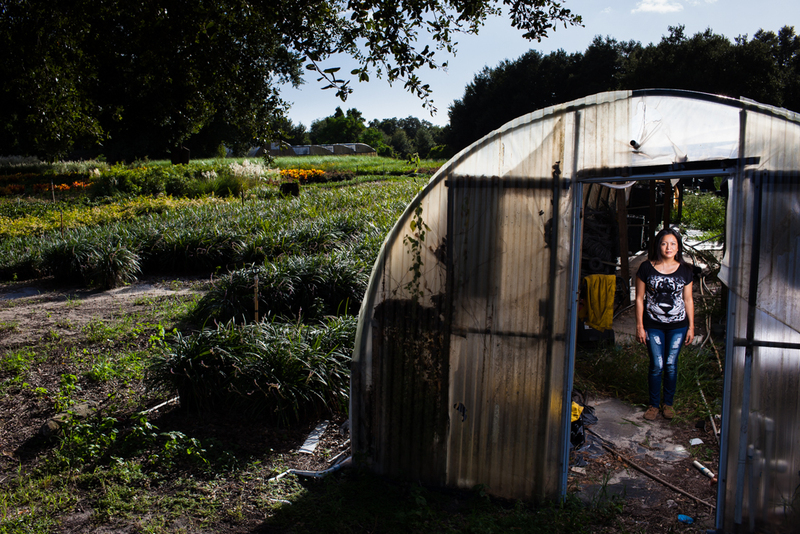 We also spoke with people who labored in the “muck fields” of Central Florida. 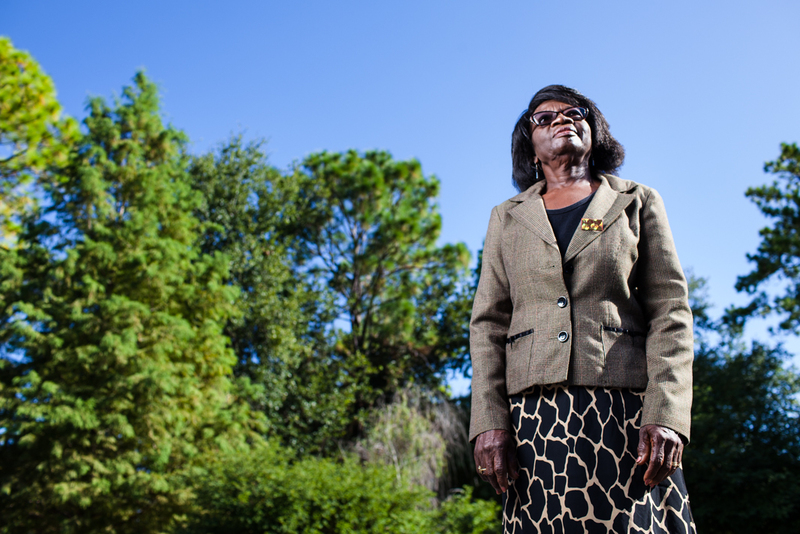 There, some 20,000 acres of Lake Apopka were drained in the 1940s to grow crops on the bottom of the lake each fall, winter and spring until 1998, when the farms were shuttered due to pollution from farmland run-off. That winter, one of the worst bird mortalities in U.S. history was linked to pesticide contamination on the farmland. "The chemicals are something else. You get rashes on your body from them. You get headaches and you feel bad without any explanation. We know it’s about the chemicals because we know what kinds of chemicals they are spraying. I have been in the fernery when they spray nearby. They haven’t sprayed right on me, but I’ve witnessed it happen to other people. Sometimes you’re working on one side, and they’re spraying right next to you on the other side. The chemicals blow from the tractor. "They spray the fernery next to my house about once a week. I can smell it inside my house. It smells awful. They say it’s not poisonous, but we know it’s a chemical and that it’s bad. I feel it in my mouth, nose and on my skin. The companies own all the houses around the fernery. I wouldn’t move if I could; I like this town. The rent isn’t too high. 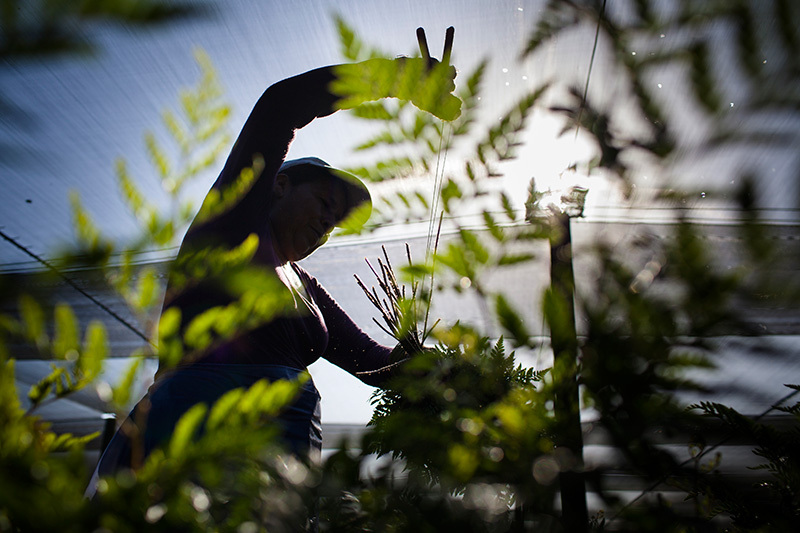 "No matter what, the supervisors need to educate the workers and the people who are spraying. We need to respect each other, and we need to protect ourselves. I think things haven’t changed because the supervisors have been doing business like this for years. They don’t educate the people. If you educate people you will also protect the business. If the EPA has buffer zones, the greater the distance the better. My house is right next door to the fernery. You can see there is no buffer zone. "I never had training at the fernery. They don’t train you. Sometimes they’ll tell you to go watch the training video a few weeks after you start working. Sometimes if you know someone who is working, they’ll show you what to do. The training is supposed to be handled by the company. And sometimes the video just talks about work that you’re not doing. I didn’t wear gloves or a mask when I was working. The video just told us to wear long sleeves and rubber boots." "Some companies don’t even put the sign up when they are spraying pesticides. We just go to work, and pretty soon, maybe an hour later, our hands start itching. Our bodies start itching. At some jobs, when the employee tells the supervisor that our hands are itching, some of them will ignore it. They’ll tell us it’s just an itch, but pretty soon our hand looks like a frog. Only when it swells up will they say we can go to the doctor. "Where I work, it’s raining constantly. There was a week where it was raining and raining. That week, they gave us a letter explaining that because it was raining the chemicals would be stronger, so we might have itchy hands. But we should still come to work. They didn’t give us any gloves. We’re supposed to use gloves to cut the fern, but they don’t give you gloves for anything. They tell you to wear long sleeves, pants, boots and gloves, but it still penetrates the clothes. "I started working in ferneries when I was twelve. After school I would help my mom and dad cut ferns. I really liked cutting the ferns so after school my dad would pick me up, and I would cut them part time. "I don’t think that twelve-year-olds should be allowed to do this type of work. I think eighteen is better than sixteen for anyone working with pesticides. Many families take their children to the ferneries after school because they don’t have childcare. I’ve seen pesticides sprayed when children were nearby." 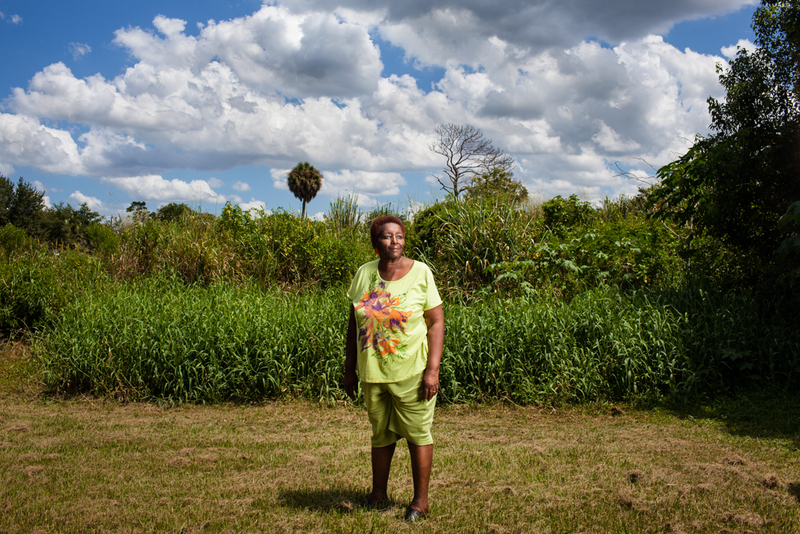 "I worked in the muck fields when they drained Lake Apopka to grow crops on the bottom land each fall, winter, and spring. It would be so hot with no shade, no way to get under a tree, and you had to keep cutting. You would sweat to keep yourself cool. And we’d be out there in the field, and they would spray the lettuce with pesticides. Did anyone know the stuff was going to make us sick? They sprayed it on us and it was real sticky, like syrup. We kept on working. We didn’t know any better. 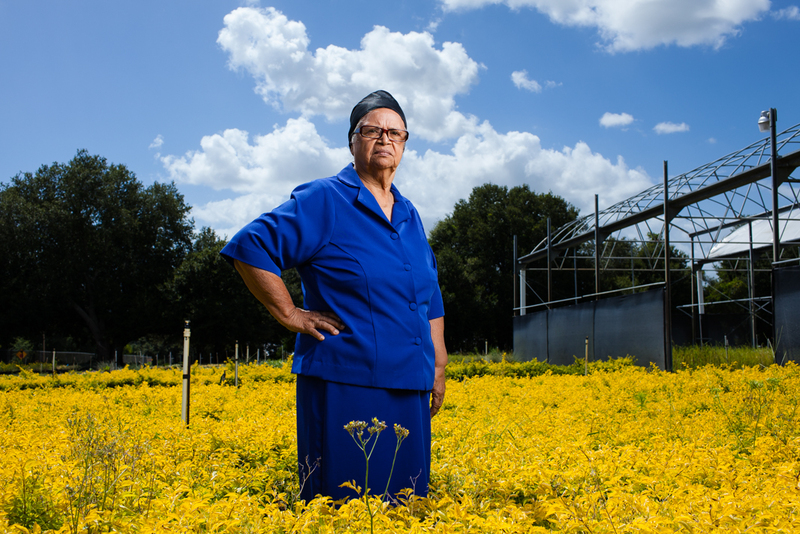 "After they closed the muck fields, I worked in a nursery. One day, they sprayed in the nursery and they told us they’re going to put a sign up to tell us what time we could go back into the nursery. The supervisor said it was time to go back in, so of course, we went back to work. I’ll never forget when that stuff was showered upon my face. It immediately started to burn and itch. After a while big knots start to form on my face. When I went to the hospital, they admitted me and I stayed for four days. The doctors told me it was chemical poisoning. Decades later my face is still scarred, and the big knots still show up on my face every once in a while. "If I could change the rules, I would put signs up everywhere to inform the workers when the pesticides are sprayed and keep them out of the workspace until it is safe. When the birds started dying on Lake Apopka, that scared you. If the chemicals were killing the birds, what is it doing to us?" 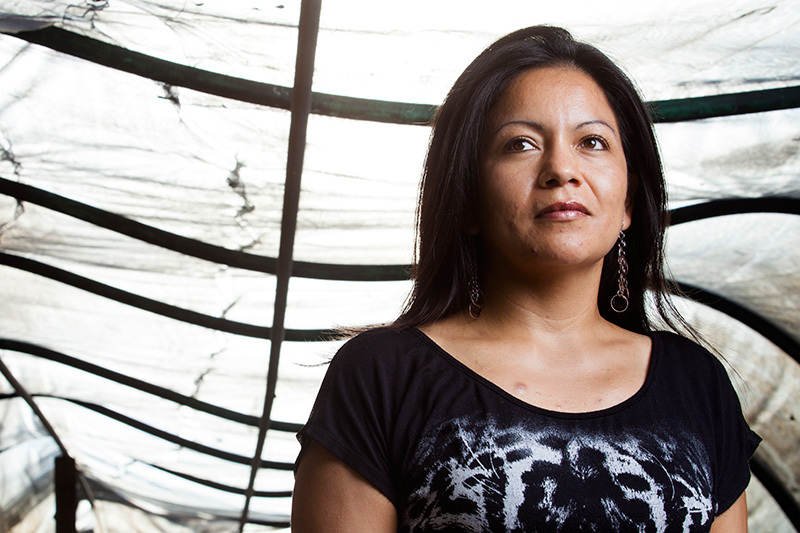 "The first time I was sprayed with pesticides, I was working at a farm with all kinds of different crops. I was working in the corn fields when they had to close the farms down because there was so much chemical contamination, and there were so many people that were sick. It used to be that nobody knew anything about the pesticides. You went to work and it was unknown. Now there are meetings and trainings, and people are more aware because of groups like Farmworker Association of Florida. "The people are working right next to the corn, and the pesticides get on them and on their clothes. 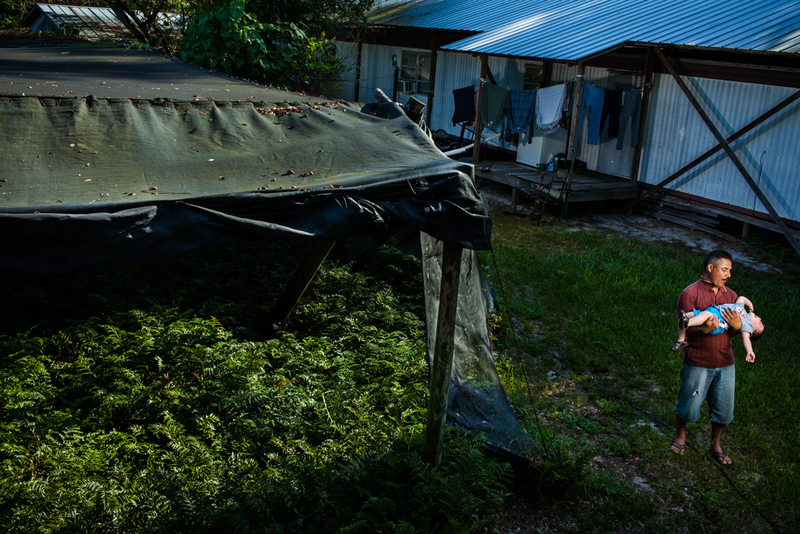 In the trailers where the people live, they go inside with their clothes full of pesticides. The trailers don’t have air conditioning, and there are three or four families in there sweating with the pesticides on their clothes and on their bodies. Many people start vomiting. "In the past I couldn’t be as outspoken because I would have been driven away from work. I didn’t want to lose my job. You can see that it’s still the same now. No one will say anything because they’re afraid of losing their jobs. To change things, we can come together in meetings like this, but in reality people are too afraid to say anything to their bosses because they need to make money to support their families. I can talk now because I’m not worried about losing my job." 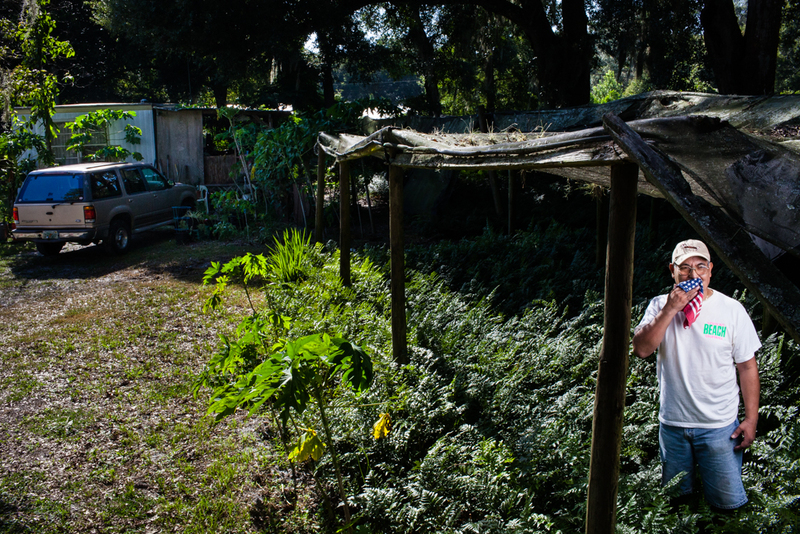 "I stopped working in the greenhouses in 2010 when my daughter was born. I was planning on going back, but she had a problem. Her cranium was prematurely closed, and she had to go through surgeries to allow her brain to develop. I still have to take her to specialists every four months. My last job while I was pregnant was working in the laboratory where they mix chemicals. I think this is why my daughter had problems, but none of the doctors have confirmed that the chemicals caused it. "In Mexico I had experience working in agriculture, but there they didn’t use the strong chemicals. So when I came here to the U.S., I was ignorant about the dangers of the exposure to the pesticides. I didn’t know how to take care of myself because the supervisors didn’t teach us what to do. "I’ve been working on a project with a group of women, and they don’t know that they shouldn’t hug their kids when they come home from work because they’re covered in pesticide residue. I want to do this work because of my experiences in the field. I’m doing a reproductive health project for pregnant women in order to try to address the lack of training that these women have. In five years, my plan is to make some changes. I hope I am making a difference. I’m trying." "I’ve been living here for 10 years in this trailer next to the fernery. We try to keep the windows closed at home when it smells very strong of pesticides. We’ll take the baby to the back room where it’s more closed off. "The ferneries don’t provide any kind of notice when they’re going to spray here. They just come in with the tractor and begin. People just have to run around and close their windows and doors because they don’t provide any notice. I live here with my wife and two kids, a baby and a 13-year-old. "Almost all of the workers have the same reaction from the chemicals. Your skin gets wet and swollen. My wife had problems, but she started putting plastic over her gloves and that protects her better. We buy the plastic ourselves. "At the workplace, we don’t see any signs with pesticide information. When we pick up our checks, we’re told that there’s supposed to be a place with a central posting that says what time the pesticides were applied and when the reentry period is, but they’re not complying with that requirement. There are signs in the office, but the bosses don’t follow them. It’s very dangerous. We’re the least paid, the hardest working, and the most at-risk workers." "I worked in ferneries for nearly 20 years after arriving here from Haiti. Now I’m a custodian at Freedom High School in Orange County, Florida. "At the high school, we use chemicals too, but the difference is they teach you about the chemicals you are using and how to protect yourself. They gave me a good mask and protective gloves. As a janitor, I had something on my hands one day, and the doctor actually said it was a chemical. When I worked in the ferneries, we didn’t get that type of information. I also have good insurance now and get paid sick and vacation days. "That’s a world away from agricultural work. The plants you pick have been sprayed but they don’t tell you that. The masks aren’t very good and people get sick. You can even get cancer from the chemicals because they are so strong. "People need to push the company to do better. Why are custodians protected but not field workers?" "When I first started my job, I was mixing water with gas to make the fumigant methyl bromide. They had this equipment that they would use with the gas, but when I opened it, it would leak out. When this happened I was very afraid because I was all by myself, and I was worried that the equipment was going to explode. So I reported it, and my supervisor told me it wasn’t a big deal, that I shouldn’t worry about it. 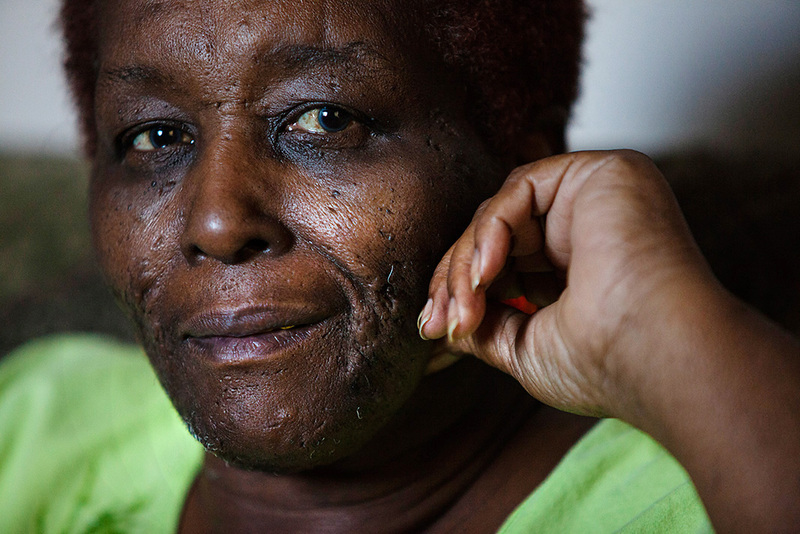 "I haven’t gone to the doctor or to the hospital because of the effects from the chemicals, but I have missed work because of the headaches. I think that I do have long-term symptoms from the chemicals. I have a lot of ongoing pain in my back. I think it’s related to the work, and it’s one of my motivations for not working there anymore. "When I was working in the nursery, I thought it was really dangerous for me to be walking across the treacherous areas in order to get to each plant with the spray gun containing the gas and water mixture. I was working for eight hours a day on top of the tubes, and I knew that this work just wasn’t for me. It might have been better work for a man or someone who was taller. "If I had fallen from the dangerous area, I didn’t know if I would get immediate assistance. I could have been injured for the rest of my life. They didn’t care about me; they just told me to keep going. People need to be more protected. I was scared to go to work. "I hope that working conditions are better when my children are grown. I’m thinking positively, and I’m hopeful. Maybe they won’t be 100% better, but I’m hoping there will be some changes from generation to generation." I hope that working conditions are better when my children are grown. I’m thinking positively, and I’m hopeful. Maybe they won’t be 100% better, but I’m hoping there will be some changes from generation to generation. 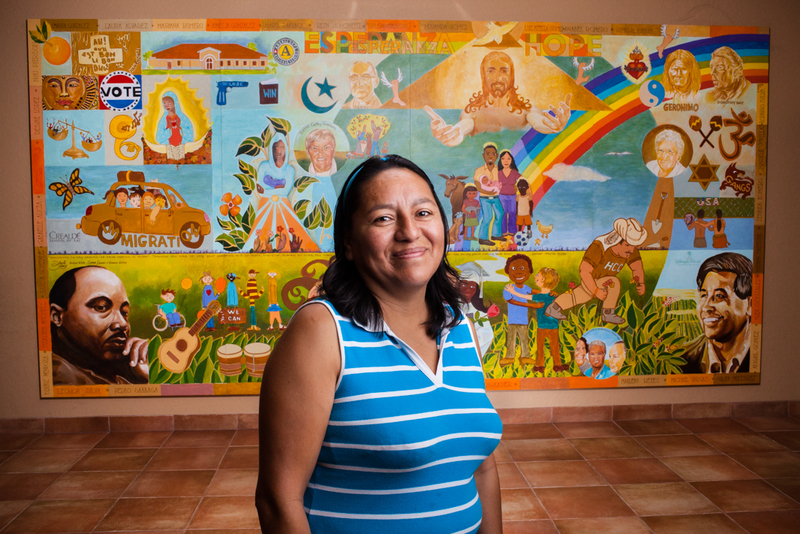 Earthjustice thanks Jeannie Economos from the Farmworker Association of Florida for her generosity and assistance in gathering these stories from the frontlines. 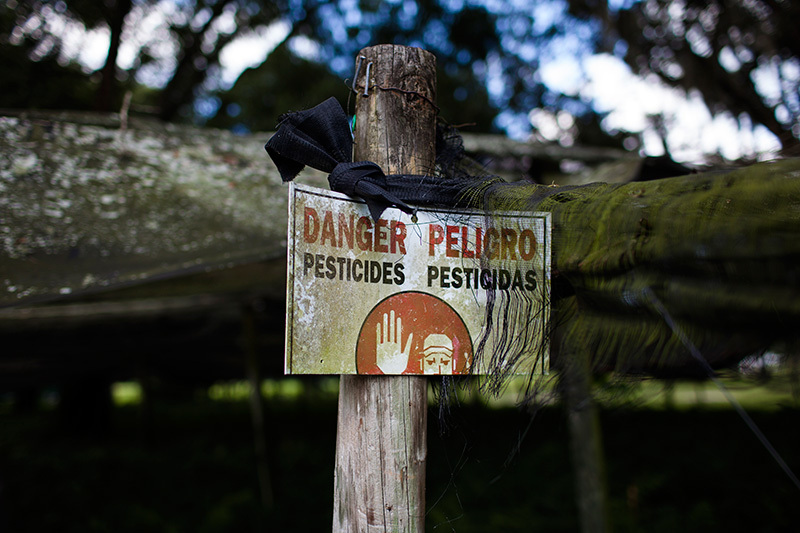 The advocacy campaign Protecting People From Pesticides works to strengthen protections for farmworkers and reduce the risk of immediate and long‐term illness to agricultural workers and their families.